Wow, second in the League after five games, who would have thought that was possible during the well publicised off season sales? Just about as unlikely was Victor Wanyama scoring the games only goal. He has had a bit of a hard time this season, but he came on to replace Ward-Prowse who had to go off on a stretcher with a nasty looking ankle injury. That switch was something which showed up the biggest difference to me between this season and last, in that now the bench has game changing players on it, which was not always the case before. Another substitution that seemed to be a positive change, was Florin Gardos coming on for Maya Yoshida, who looked to have picked up a knock, but as Koeman said afterwards, both centre backs had picked up yellow cards in the first half. Gardos looked at home immediately and saw a lot of the ball. I can easily see our two starting centre backs being Alderweireld and Gardos before too much longer. Unfortunately Alderweireld was missing this afternoon with a thigh strain/hamstring injury, although Koeman said after the match that he should be fit to return for next weeks QPR game. Steven Davis has not been his usual self for the last couple of games, so it was not really no surprise that Ward-Prowse got the nod. Other than this and Yoshida coming back in for the injured Alderweireld, it was 'as you were' for the rest of the team. This was always going to be a challenging game, with Swansea playing in a very similar style to Saints. From the off, it was Saints who had their backs to the wall, as Swansea came at them in waves. Clyne and Bertrand had their work cut out. Bony in particular seemed to have something against Yoshida, giving him a hard time. Meanwhile, the Swansea goalie was virtually unemployed for much of the first half, Saints taking at least half an hour to mount any sort of shot on goal. Bony had already been booked for a clumsy challenge on Maya Yoshida, when five minutes before half time, he did another clumsy challenge on the same player, with the same result - another booking. The end result of a second booking of course, was an early bath, as he was dismissed. Swansea were reduced to ten men for the whole second half. There is no doubt that this was a turning point. Up until now, Swansea had been in the ascendant, but for the majority of the second half, it was Saints on top. At the start of the second half, Yoshida made way for Florin Gardos. He took to the game like the proverbial duck to water. Calm, effective, a rock in defence. Another Saints star in the making. Looks like Les Reed and his team have turned up another gem. Steven Davis came on for Jack Cork and promptly looked far more effective than he has down at any other match this season. The key change happened in rather distressing circumstances, with about twenty minutes left, when Ward-Prowse took a knock on his ankle and had to be taken off on a stretcher. His replacement was Victor Wanyama, who clearly had a point, or two to prove. He ran about like a man possessed. Swansea were really up against it now and were clearly tiring. Saints were completely on top, yet somehow just could not score. Pellè in particular, seemed to be having a bit of a mare. 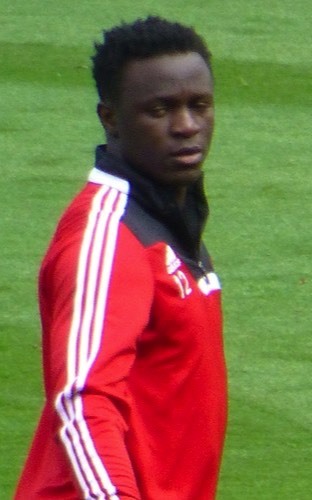 Then it suddenly clicked and finishing off a great move, Wanyama shot high into the top corner of the Swansea net. Strangely enough, Big Vic did not look too pleased and not a flicker of a smile crossed his lips. Maybe it was the shock of scoring. From here, to the end of the match, Swansea threw absolutely everything at Saints and we were treated to the slightly unusual sight of Ronald Koeman going absolutely apoplectic with rage, at the Saints team as a whole, and Dušan Tadić in particular. The team were allowing Swansea far too much of the ball and dropping deep, putting even more pressure on Saints defence. However, hold out they did and after four minutes time added on, the final whistle sounded. So, three more points and another away win in the bag. This was a game when Saints were nowhere near their best, but they still had enough in them to scrap out a win. It may be early in the season and second place in the Premier League table may not mean that much yet, but it definitely is a whole heap better than any Saints fan could have expected this summer.